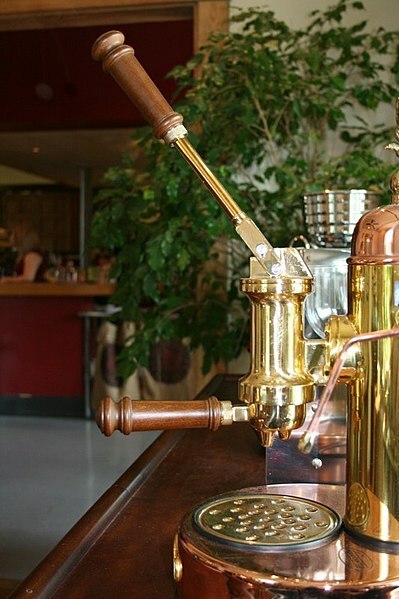 Are you considering buying a manual espresso machine? ROK espresso machine may be the choice for you. Manual espresso maker can sound like a very intimidating piece of equipment to have in your coffee arsenal, especially if you do not consider yourself as an expert on the art of coffee extraction. If you have been drawn by the allure of a manual espresso machine but have been intimidated by the skill required to operate one, we would be glad to introduce to you the ROK Manual Espresso Machine. Read this ROK Espresso maker review to know more about how it can make your coffee brew the best ever. 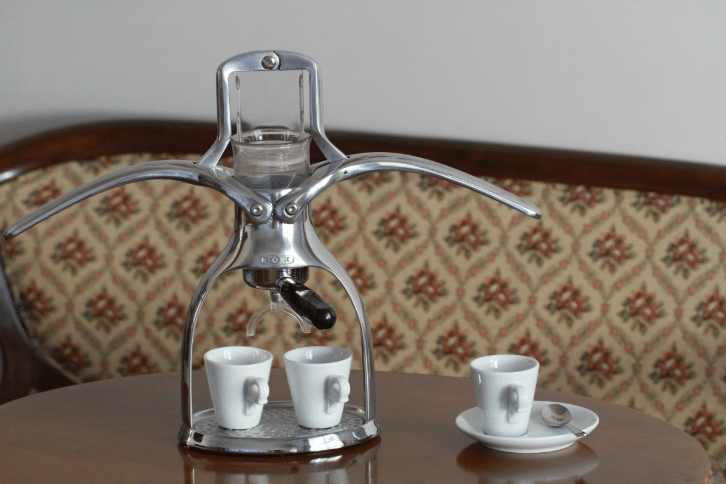 The ROK Espresso Maker – What makes it so special? This is a very unique coffee grinder that can brew your cup of espresso without the need of an external energy source like electricity. While you might find a small learning curve, this ROK Presso Manual Espresso Maker is not difficult to use at all. All you need to do is put your inputs in and the machine will do the rest by itself. ROK first introduced a manual espresso appliance in 2—4 as the Presso. But the appliance was re-launched in 2012 as the ROK Press Manual Espresso Maker with some great improvements. It is committed to providing a simpler and less complicated appliance that can produce the best cups of coffee for you. One of the first things that you will notice about the product is the neat packaging, which is well-done and nothing short of remarkable. Each and every component of the grinder comes in a stainless steel tin foam fittings so that everything remains safe from the transportation. It is more portable than even the cheapest espresso machines. As we know, the ROK is a non-electric espresso machine. This is one of the best attributes of the appliance. There are no wires or machine maintenance required. You will even have a 10-year warranty. Most people would think this as a negative attribute since a machine has intricate heating elements that maintain a constant temperature throughout the brewing process and the pressure forces the water to be consistent. While control over these variables might not be that easy in the case of the ROK coffee press, but the stainless steel is easily cooled and the arms do not create constant pressure. 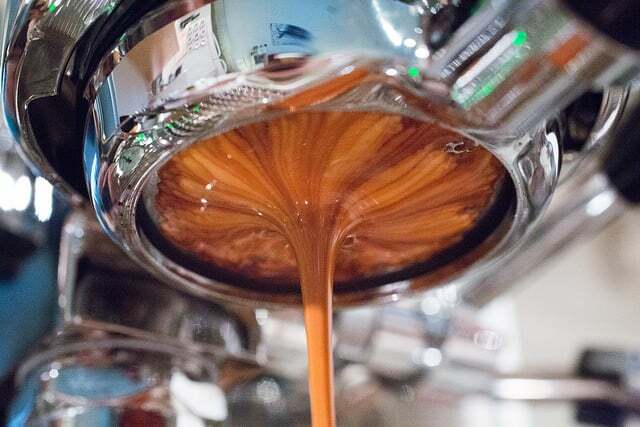 The build of the ROK espresso is excellent and is made of high-quality and attractive metal alloy that the manufacturer boasts has 35% higher tensile strength than in the original iteration. The arms have also been made sturdier since the original Presso had problems of snapping its arms. This espresso maker will give you no such problems. The scoop you will see with the ROK espresso also acts as a tamper and gets the job done. You will also see the milk frother, which is very easy to use. If you want to froth your milk, you can warm it up for about a minute, set the frother into the cup or bowl, and pump till you are satisfied. Pressing the arms should not be a difficult task for adults. The size is very compact making it suitable for even the smallest kitchen counter. Weight is around 7 pounds so it is easy to carry while you travel or even take it to your workplace. Portafilter with Splitter spout which includes a portafilter of 49mm. Handy plastic scoop for measuring the coffee grinds and also serves to tamp down the coffee grounds. Milk Frother is a sleek looking stainless steel cylinder that creates frothy milk for your cappuccinos, lattes and macchiato. The reusable trendy design storage tin makes everything compact and can store the scoop as well as the double shot detachable spout. You can start off by grinding some coffee beans to a very fine powder first. The ROK hand press espresso maker is not actually designed to use standard measurements; hence an adapted technique will be required. You can fill the portafilter up completely, which should take about 12gms of ground coffee approximately. Next, make use of the scoop to press or tamp down on the grounds evenly while applying some significant amount of pressure. You might end up with some coffee on the portafilter’s walls and might be a bit uneven. Attach the portafilter on the body of the appliance. With arms completely downwards, you will need to pour boiled water into the upper chamber. According to the instructions, you need to fill the water just above the metal rim for a very consistent level of brewing pressure. Now, you need to lift the arms of the appliance all the way up till you feel a resisting pressure and hold it for a few seconds. 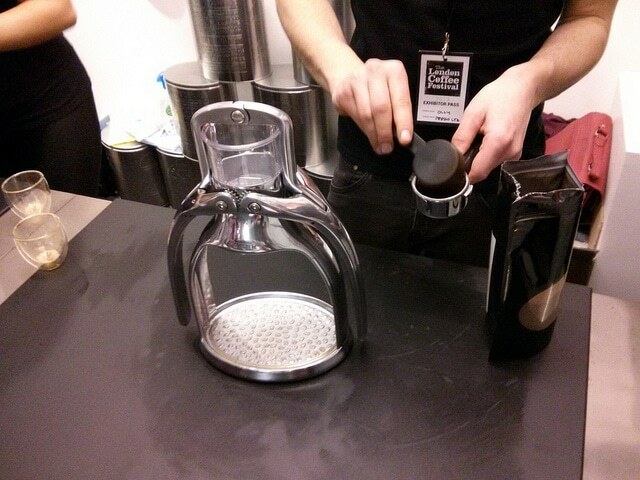 By doing this, you are allowing the water to briefly pre-infuse with the coffee before the pressure is applied. After this, press down again. Do not press down slowly and press as far as the arms can go. Initially, you will not see anything coming out of the spout, but you will see a steady steam in a second or two. When the stream starts to lose pressure in about 10 seconds, repeat the process again for another 10 seconds. You should never repeat this process till you use up the entire amount of water; it is just too much. The two-time extraction is good enough. Discard the remaining content as they will be bitter and over-extracted. For a first timer, it is obvious that you will not be able to produce a perfect espresso in the first time itself, unless you can control all the variables like timing, pressure and temperature. 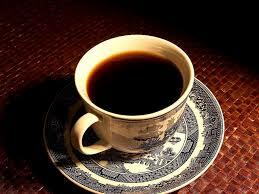 Hence, you can add some water to make an Americano or some warm frothed milk to make a latte or a cappuccino. This is because the ROK Presso Manual Espresso Maker can potentially replace electric and traditional espresso machines because it does not need electricity or any other power source to function. The ROK Presso Manual Espresso Machine will last for a very long time to come. These espresso appliances are known to have the kind of durability that you will not see normally in regular coffee grinders. This is because everything on this device is mechanical and has no electrical circuits. Thanks to these grips, you will not have to worry about the appliance slipping off the shelf. The grips will also keep the appliance secure while you are working on the espresso machine as well. Yes, the appliance is quite small and can be carried around in your vehicle if you are planning for a picnic in the woods. The only drawback in this advantage is that the appliance is bulky and cannot be carried on person for a long time. As seen above, the brewing process is very easy. You do not need to be Einstein to figure out the whole brewing process. All you need to do is follow the instruction and practice a bit. The milk frothier leaves a lot to be desired. You are way better off with using a glass cafeteria and froth the milk manually. Since it is not electric, you need to boil water in a kettle separately. Now that you have gone through the pros and cons of this manual ROK coffee maker here are a few tips to ensure you get the best tasting brew from the manual espresso machine. Keep the portafilter locked securely. Sometimes it may not lock properly leading to water dripping on to the sides. The brew will taste better when you use the right amount of coffee and more importantly good quality coffee beans that are freshly roasted. 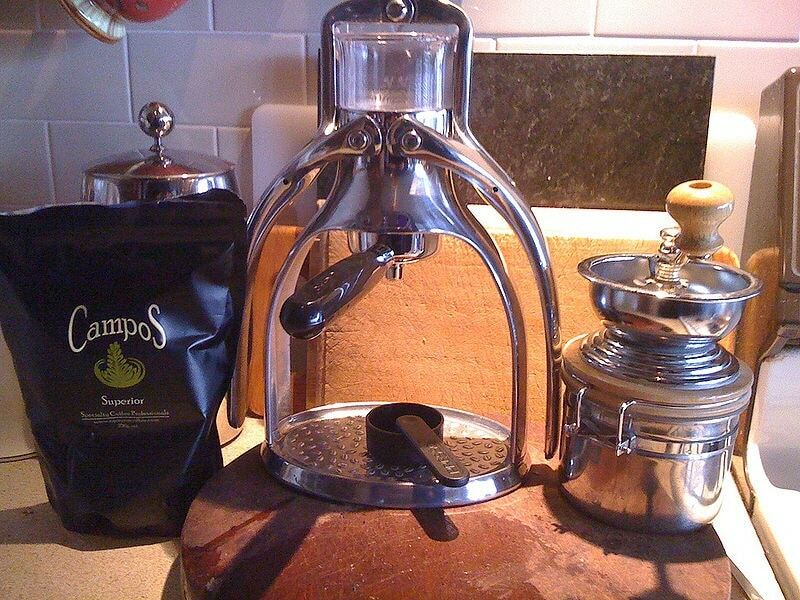 And keep the chamber and the cup heated for a proper extraction. Further another significant part of the process is the temperature of the water you use for the brew. The water you use should be not lessthan 92 degrees, in other words, it should be near boiling point for the right espresso brew. In theory, the electricity-free manual machine that is easy to understand, use and carry sounds great. But the question is that can it brew the perfect espresso enjoyed by coffee enthusiasts? Overall, this appliance might not work out for people who are looking for the perfect brew of espresso, and not by the means of manual brewing. On the other hand, the ROK Presso Manual Espresso Machine can suit people who appreciate the novelty of the appliance and also understand the trial-and-error method way to perfect the brewing method. The fact that you do not need electricity to run the appliance and being portable makes it a great addition to have if you are planning for an at-home barista. You have the option to tinker with the enjoyable process of making espresso completely by hand, for not much of an investment. From our ROK espresso maker review you will know that this machine is a very durable gadget but is limited by the addition of some cheaper parts that prevents it from truly being a masterpiece that will last for a lot of years to come. While it is easy to use, you will require time and practice to brew that perfect cup of espresso. And when you reach that point you will be really glad you made the choice as nothing beats the boost that a good shot of espresso coffee can give you. Cuisinart Single Cup Grind and Brew Review – Good Enough?